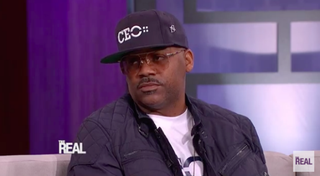 Dame Dash is speaking out about the death of his late girlfriend, R&B singer Aaliyah, almost 15 years after her death. During an appearance on The Real, airing Tuesday, Dash says things would have been different if he had been there. On a recent episode of Family Therapy With Dr. Jenn, Dash stated that Aaliyah's death turned him into a monster, and The Real's Jeannie Mai asked if there was any chance he would have been on the plane that crashed and killed Aaliyah and her friends. "There is no chance that, if I was there, we would have been on that plane," he said. "So it would have never happened that way." Dash said he was totally against having Aaliyah film the video for "Rock the Boat" in the Bahamas, and said Aaliyah wasn't comfortable with the plane she and her crew were flying in. "She told me she was going to the Bahamas, and I was against it, like, 'Yo, don't go.' And then down to the last—we had the Blackberry—down to the last Blackberry that we had, before she went there, she was like, 'Yo, I don't like that plane.' And I was like, 'Don't get on it.' And she was just like, 'You know, I gotta do it.' You know, it was a complicated situation, but she had to go do that video." On the day of the crash, Aaliyah and her crew took a smaller plane, a day earlier than scheduled, to leave the island. The plane crashed within minutes of taking off. "If I was there, I would have made sure that that jet that was supposed to be for her? She would have been on that," Dash said. "I wouldn't have got on that plane, you know what I'm saying? So it probably would have been different. But you know, um, everything happens for a reason. You know, and what doesn't kill you makes you stronger, and you just gotta deal with the cards that life deals you."